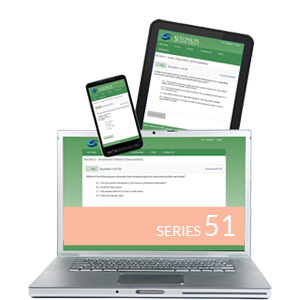 Sample a FREE demo of our Series 51 Online Exam Simulator here! What a relief. I didn't get a chance to study that much, but your online sample questions were spot on and the reason why I passed [the Series 79]. I just passed the S51 with an 86%. I want to express my sincere thanks to Solomon. I love the way you structure your practice exams. I always enjoy receiving speedy responses from Ask the Professor, especially from Karen. Karen, thank you for all your help, you are the best!!!!!! !